Who doesn't love game picks? Everybody loves seeing our writers take sides until, of course, we pick against their favorite team. Well, fear not, because several of our correspondents are here to "sleep on" and "disrespect" your favorite program just before its biggest game of the year. Or maybe we'll pick your team, who knows. Anyways, here are the picks. Joe Parello, Editor-in-Chief: Xaverian has come a long way, and there's no doubt that first-year head coach Al Fornaro looks to be a great successor to the legendary Charlie Stevenson. But let's be real, this Everett team has generational talent. With numerous national recruits, speed galore on both sides of the ball, an underrated offensive line, and smart quarterback, it's hard to bet against the Tide. Matt Feld, Executive Reporter: Those expecting a Crimson Tide blowout will be disappointed on Saturday night. Xaverian is playing as well as they have all year under coach Al Fornaro. Ike Irabor and Michael Saliba form a power backfield, while Cooper DeVeau is dangerous in the slot and in the secondary. Brian Abraham, meanwhile, can give an opponent wide receiver fits with his size. Still, the Tide have too many weapons and will pull away late behind Jake Willcox, Isaiah Likely, and Jason Maitre to win their second straight title. Tom Joyce, Correspondent: Look at the way their first matchup of the year went (38-7 Everett). Xaverian wasn’t completely put together until about midway through the season, but it is hard to imagine any team making up a 31-point differential in a matter of two months over the top-ranked team in the state. Nate Rollins, Correspondent: Everett and Xaverian in the Super Bowl. What’s new? For the third time in the past four seasons, these two powerhouses will duke it out with a state title on the line. Last December it was the Crimson Tide who “upset” the Hawks for the crown. In a Week 1 tilt this fall, the Crimson Tide thrashed the Hawks, 38-7. I don’t expect much to change this time around, albeit Xaverian is improved, but it can’t hang with Jake Willcox and Co.
Joe: To me, this is the best game of the bunch, and I've gone back and forth over and over again with this pick. I love Lincoln-Sudbury's diverse running game. Quarterback Braden O'Connell is slippery, running back James Dillon is explosive, and power back Andrew Marshall has a special place in my football heart as the MIAA's version of Jerome Bettis (he's basically a bowling ball with ballerina feet). Still, my gut tells me not to doubt that champs, and do-it-all star Shane Frommer. I expect this one to be a back-and-forth affair, with KP's battle-tested defense rising up to make that one play that is the difference in the game. Matt: Lincoln-Sudbury presents King Philip with similar challenges that Bridgewater-Raynham did back in the South sectional final. Marshall and Dillon are two durable power backs, while O’Connell can torch opposing defenses with his legs should he break contain. Every time Frommer and company have been challenged, however, they seem to play their best. Frommer is as tough a running back as there is in Massachusetts, and quarterback Brendan Lydon is surely fired up to finish his career with an exclamation point. L-S and KP trade blows through the first three quarters before a late Frommer touchdown run and an interception by Andrew Dittrich seal King Philip’s second straight Super Bowl win. Tom: It’s a bout of undefeated Warriors, who both possess excellent defenses. However, it would be a sin to pick against King Philip on a 24-game win streak, especially when their defense has allowed under 11 points per game this season. Nate: Lincoln-Sudbury is one of the most dynamic teams in the state. The L-S offense - sparked by its potent ground game - has scored 470 points in 11 games. Its defense isn’t too shabby either, as it’s holding opponents to 13.6 points per game. King Philip is great, but I expect Tom Lopez’s defense to load the box and really minimize the KP ground game led by Shane Frommer. In a loaded slate, this will likely be the best game of them all. Joe: This could be the most exciting game of the entire weekend, with record-setting St. John's quarterback Steven Bucciaglia going head-to-head with North Attleboro gun slinger Chad Peterson. Both teams have underrated running games as well, and talented defenses, though North Attleboro has been a bit more consistent on that side of the ball. But, in the end, I think the St. John's weapons are just a bit too much, even against a defense as tough as the Red Rocketeers'. Matt: North Attleboro head coach Don Johnson and St. John’s head coach John Andreoli were teammates back at Holy Cross, so there is no lack of familiarity between these two sides. The Red Rocketeers have had success running the ball so far in these playoffs, and if they are able to do so again from the outset on Friday, it should open things up for Peterson through the air. Still, this St. John’s team simply has too many weapons, particularly when it comes to accounting for all three backs in Dennis, Deso, and Byers. With just 10-minute quarters, a couple of early scores by the Pioneers may be all that is needed to put this one out of reach. 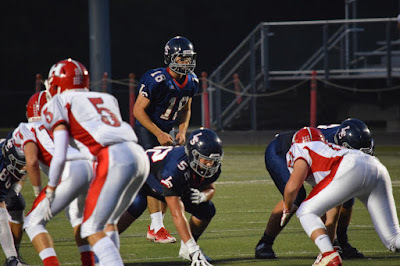 Tom: It’s definitely tough to pick against arguably the best quarterback in the state in Steven Bucciaglia, but North Attleboro played a tough Hockomock League schedule and matched up well against King Philip back in Week 1. This is the team that shut out Duxbury’s prolific passing attack, 35-0, in the Div. 3 South sectional finals, and it’s also hard to pick against that stat. Nate: I’m always wary of picking a team out of the Central to beat a squad from the South, purely based on the talent they’re exposed to during the course of the season, but this is an exception. When deciding who will win a shootout, one must decide who owns the top quarterback and whose defense will get the stand it needs. I’m rolling with St. John’s on both. Joe: This come will likely come down to two different play makers: Melrose running back Isaac Seide and Nashoba athlete Breese Hill. Nashoba is physical in both trenches, so you would think they might be able to slow Seide down, but so far that's been easier said than done this postseason. Still, I'll go with a stingy Nashoba defense, and Hill making plays from his wide receiver and safety spot to lead the Chieftains to their second state title in three years. Matt: The Chieftains have won their fair share of rock fights this year, including a 21-19 win over Marlboro to get to the Super Bowl. Melrose presents a new test with the speed of Isaac Seide, who has blitzed opponents all season long. Still, I think running back Alex Childs and Nashoba find a way to control the pace of play, and come away with a squeaker to win another state championship. Tom: A rare Central Mass over Eastern Mass pick (though not rare among our writers). But Nashoba won the Div. 2 State Championship two years ago, and now they’re a Div. 4 team. That has to play in their favor, especially since they allowed under 10 points per game all season. Nate: Melrose comes in boasting a 12-0 mark with quality regular season wins over Masconomet and Stoneham, and playoff triumphs over Dracut, North Reading, Marblehead and Hopkinton. Nashoba, despite having a 10-1 record, hasn’t really been tested. In its one “statement” game against Shrewsbury, it was blown out, 35-7. Joe: Conventional thinking says this one turns into a shootout, but both teams actually come in with dominating defenses as well. Given that both defenses are so stingy, I'll go with the offense more capable of staying balanced, and that looks like D-Y from where I'm standing. Still, I am experiencing a bit of anxiety betting against Vaunell Hill, who has been nothing short of astonishing this season for West Side. Matt: It has been quite the season for Vaunell Hil and West Springfield. The Terriers running back has run for nearly 2,000 yards while amassing 25 touchdowns. West Springfield, however, has yet to go up against a team like Dennis-Yarmouth. The Dolphins are a Top-10 caliber team in Massachusetts, and behind quarterback Jacob McCarthy, running back Bobby Evans, and defensive standouts Joe Tierney and Daryan Thompson, will capture their first Super Bowl since 2011. Tom: There might be a slight bias here, but any Div. 5 team that can steamroll Marshfield is pretty special (Ed. Note- Tom was a HIGHLY decorated long snapper at Marshfield). D-Y has put up over 40 points per game this year and, while they are facing a West Springfield team that has excelled all year, it’s a South vs. West matchup. From my own experience playing against Longmeadow in 2014, the advantage has to go to the south. Nate: Bobby Evans-led Dennis-Yarmouth has rolled over its opponents this season, and there is no reason to think it will be any different on Saturday. The 12-0 Dolphins are averaging 43 points, while giving up just 12. Complementing Evans on the D-Y offense are the likes of QB Jacob McCarthy and wide receivers Michael Gurney, Geoffrey Jamiel and Daryan Thompson. West Springfield hasn’t seen an offense like it’s about to. Joe: Middleboro is more battle-tested, but the Tigers have been here before, and this small-school program fears no stage. I'll roll with the Littleton line and stable of backs to wear down the Sachems, and the Tiger defense to close the door at the end of a close game. Matt: The Sachems are making their first Super Bowl appearance in 34 years and are not about to let this pass them by. Quarterback Evan Gwodz and running back Jeremy Soule are relentless on opposing defenses, with Gwodz posting 31 touchdowns and Soule 15. Littleton has their own offensive firepower with a triple rushing attack comprised of Mitch Beudoin, Brad Klock, and Kevin Frisoli. The three have spearheaded a Tiger offense that has posted 36.9 points per game. Still, Middleboro seems to be playing its best football right now and is primed to run past Littleton en route to a championship. Tom: Both of these teams can put points up on the board and, while Littleton is going for a perfect season and has a talented offensive line, Middleboro is battle-tested coming from the South Shore League. This should be a high-scoring affair, but the edge has to go to the South team. Nate: Sachems are on a mission to lock down their first Super Bowl since 1983. Middleboro is led by its “big three” on offense in quarterback and South Shore League Player of the Year Evan Gwozdz (31 touchdowns), running back Jeremy Soule (1,400 yards, 15 touchdowns) and wide out Colin O’Brien (10 touchdowns). Littleton’s biggest strength is its run game - spearheaded by 1,000-yard rusher Brad Klock who is joined by Mitch Beaudoin and Kevin Frisoli. The last time the Sachems went against a dynamic ground game, against Old Rochester, they cruised to a 30-21 victory. Pat Kingman has been building this thing up for a while now, and they're not about to let an opportunity like this slip by. Joe: Blackstone Valley Tech has been an unreal story this year, and the Beavers have more talent that any Voke school team I can remember from Central Mass. Unfortunately, they're facing off against a bonafide dynasty in Mashpee, as the Falcons are loaded pretty much across the board. Don't count BVT out, but there's a reason why Mashpee is a two-time defending state champion. Matt: Experience is at a premium this time of year, and Mashpee has loads of it. The Falcons are looking to win their third consecutive championship, and by the looks of it, they are well on their way. It has been a terrific season for Blackstone Valley. The Beavers have three shutouts on the season and held points to single digits in their first eight games. Mashpee, however, represents a whole new challenge, with South Shore League Player of the Year Xavier Gonsalves wreaking havoc on both sides of the ball, and DaVaun Ford lethal in all phases of the game. Look for the Beavers to hang around before the Falcons pull away in the fourth. Tom: Mashpee has a chance to win three straight state championships. They’re on a 19-game winning streak too, so it would be hard to pick against them. I won’t. Nate: Mashpee is no stranger to the big stage, as it’s vying its third straight Super Bowl title. The Falcons have a chance to establish themselves as a dynasty, and I don’t see anything stepping in the way of that. Seeing how Mashpee handled St. Mary’s (Lynn) - which appears to be a far superior team to Blackstone Valley - leaves little doubt in my mind that it will walk away victorious. Joe: Count out Millis at your peril. Many slept on the Mohawks after they lost their season opener to Holliston, then again when star sophomore offensive tackle Kevin Pyne was lost for the season. Yet, here the Mohawks are, looking to repeat as state champions. Hoosac Valley brings one of the more interesting offenses to Gillette in the form of its patented Flex-Bone, and the Hurricanes are red-hot, but Millis' experience and talent should carry it to victory. Matt: This is sure to be an instant classic. Millis and Hoosac Valley each bring in some of the top offensive firepower in the state. The Hurricanes posted 76 points in their state semifinal win, and 101 points combined in their two Western Sectional contests. Millis, meanwhile, is looking for their second straight state title and, behind quarterback Bryce Latosek, the Mohawks will secure it with a late score. Tom: Millis won it all last year against Maynard, so it makes sense to pick them yet again. They have proved they are a winning program and on their 11-game winning streak, they have only let up about 11 points per game, making them one of the best defenses in the state. This should help them earn their second straight title. Nate: Millis just seems to take its game to a new level when it gets into the playoffs. In the Mohawks’ four postseason wins this year ,they’re averaging 40.5 points per game. Bryce Latosek is one of the most underrated quarterbacks in the state, and I’m sure there aren’t too many more out there Dana Olson would rather have leading his club Saturday. Millis claims its second straight Super Bowl, this time at Gillette.